Having a ‘whoop’ of a time thinking about ‘whoops a daisy’! Have you seen the movie ‘Notting Hill’? Have you seen the scene where Hugh Grant keeps saying ‘whoops a daisy!’? With regards to the historical background of “whoop” as a verb, it relates to a falconer who whoops his hawks and dates back to the early 1400s. If you cried ‘whoop’ during a hunt this would indicate to your fellow hunters that your quarry, your target animal, or game, was dead. Whoop also appears in slang, for example ‘to whoop it up’ which means to have a jolly good time, or to ‘live it up’. “Making whoopee” arose in the US around 1927. Plus, something not so pleasant, for us Brits the term “whoopsie” is apparently a child’s word for excrement. So for anyone who mixes American and British English you must be careful to be clear between making whoopie, and making whoopsie! Things could go really wrong! Finally, yes people really do say this! Well… I do, and so does Hugh Grant! https://skypenglish4u.com/wp-content/uploads/2014/04/whoops_a_daisy-01-1.jpg 1500 1500 Jessica http://skypenglish4u.com/wp-content/uploads/2016/10/SE4U2-2-4.jpg Jessica2014-04-28 18:04:512014-04-28 18:04:51Having a ‘whoop’ of a time thinking about ‘whoops a daisy’! This cartoon is based on the double meaning of click. A click is a short, sharp sound. “Turn the handle until you hear a click.”In informal English, click is used to describe what happens when you suddenly understand or remember something. “I had to read the report a couple of times before it clicked.”A seat belt fastens around someone travelling in a vehicle or aircraft and holds them in their seat if there is an accident. “Oo” vs. “W” – Especially for my Japanese students! This topic is one that doesn’t seem to be a problem for some people when learning English, but I’ve seen that it can be especially difficult for Japanese learners. Because most Japanese learn with カタカナ(katakana), some of the sounds are not exactly right. Unfortunately, sometimes theウ sound is also understood to be the “w” sound as in “would” or “winter.” Actually. these “w” sounds do not exist in the Japanese language. It will take some extra training to learn how to move your mouth to pronounce this sound. You can do it! 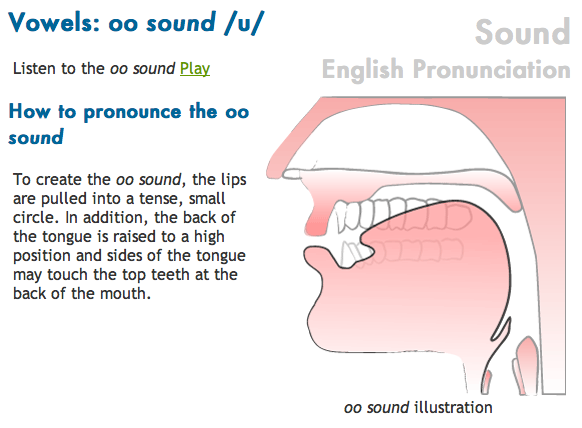 Above is a picture of pronouncing “ウ” or “oo,” that most of you know how to do. Simply make a small circle with your lips when you are pronouncing the sound (find the full lesson here). This picture, however, is more difficult to do. Try to focus on closing your lips a little more, and bringing them in closer to your teeth. 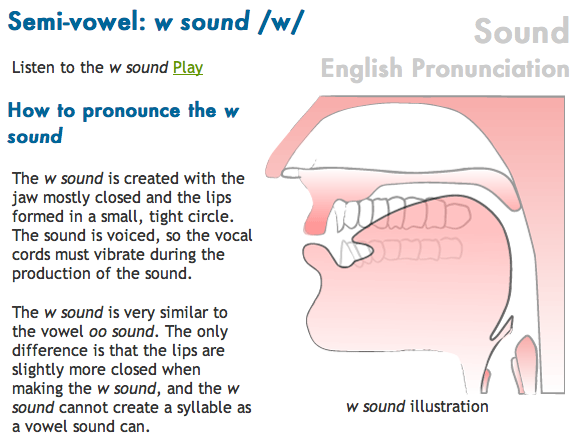 Also, the “w” sound is not a whole syllable like the “ウ” sound, it is only the first part of a longer sound. So, say it quickly. Did it sound different from the “ウ” sound? If not, try again and listen to the lesson here. Keep trying until you get the sound you want, practice makes a better English speaker! http://skypenglish4u.com/wp-content/uploads/2016/10/SE4U2-2-4.jpg 0 0 Kelsey http://skypenglish4u.com/wp-content/uploads/2016/10/SE4U2-2-4.jpg Kelsey2014-04-22 17:06:262014-04-22 17:06:26“Oo” vs. “W” – Especially for my Japanese students! It’s just a comma! Or is it? I’ve had a lot of questions recently about punctuation and the role it plays in English. So is punctuation important when you speak English? I think so. Let’s look at the simple comma. Some people say that commas can help you put pauses in a sentence, to help you speak with clarity and definition. I agree. I think that they help you to deliver a message clearly. Yet others insist there are rules for when you use a comma or not, although they do help you to translate written words into effective verbal communication, with the correct significance. In truth, there is a lot of discussion about it. There is a comma, known as the Oxford comma, which the rules of American English do not see as important but the rules of British English insist you use correctly. This is the comma used before the coordinating conjunction (e.g. and, or, etc.) at the end of a list. ‘I booked the comedians, Laurel and Hardy.’ This could signify that you booked some comedians for your celebration and they were called Laurel and Hardy. Yet if you write, ‘I booked the comedians, Laurel, and Hardy.’ This signifies that both Laurel and Hardy were booked for the event, as well as some comedians. I like the idea of using the Oxford comma, but what do you think? Simply put, connected speech is when a speaker puts words or sounds together in a sentence such as “gonna” (going to) or “wanna” (want to). Usually, this is not understood at all by the English learner!! Have you ever heard something like “I’m gonna go ta tha store, do ya wanna come?” What does this mean?? When the native English speaker says things like this ^, it is usually just to make their speech easier and more efficient. In fact, the main goal of a native speaker is usually not to be correct, but to be efficient. So, when you are trying to speak perfectly, remember that even native speakers don’t always sound perfect! Elemental English discusses this topic here. “Going to” changes to “gonna,” “to the” changes to “ta tha,” “you” changes to “ya,” and “want to” changes to wanna.” Of course, this is not correct English and should never be in writing… However, if you want to better understand native speakers, I would recommend practicing listening for these connected words. Below is a great example of connected speech in a scene from the classic movie “Remember the Titans.” Watch the video and see if you can understand what they’re saying. If it is difficult, try reading the text below and notice the connected speech. Does it make sense this time? Great! Bertier: Aight man. Listen, I’m Gerry, you’re Julius. Let’s just get some particulars and get this over with, alright? Big Ju: Particulars? Man, no matter what I tell you, you ain’t never gonna know nothin about me. Bertier: Hey- Listen, I ain’t running any more of these three-a- days, okay? Big Ju: Well, what I’ve got to say, you really don’t wanna hear ‘cuz honesty ain’t too high upon your people’s priorities list, right? Bertier: Honesty? You want honesty? Alright, honestly, I think you’re nothing. Nothing but a pure waste of God-given talent. You don’t listen to nobody, man! Not even Doc or Boone! Shiver push on the line everytime and you blow right past ‘em! Push ‘em, pull ‘em, do something! You run over everybody in this league, and everytime you do you leave one of your teammates hanging out to dry, me in particular! Big Ju: Why should I give a hoot about you, huh? Or anybody else out there? You wanna talk about the ways you’re the captain? Big Ju: Captains supposed to be the leader, right? Bertier: Right. Big Ju: You got a job? Bertier: I have a job. Big Ju: You been doing your job? Bertier: I’ve been doing my job. Big Ju: Then why don’t you tell your white buddies to block for Rev better? ‘Cause they have not blocked for him worth a blood nickel, and you know it! Nobody plays. Yourself included. I’m supposed to wear myself out for the team? What team? No, no, what I’m gonna do is I’m gonna look out for myself and I’m gonn get mine. Bertier: See man, that’s the worst attitude I ever heard. Big Ju: Attitude reflects leadership, captain. Each spring, people throughout the world celebrate Easter. Many spend it painting or hunting for eggs and eating chocolate bunnies. Often, children will even flock to their local malls to meet and take pictures with the biggest bunny of all, the Easter Bunny. But how did a giant bunny even become one of the most recognizable symbols of Easter? Here are the top five reasons why we celebrate Easter with a bunny! For centuries, rabbits and hares have represented not only Easter but spring in general. Rabbits have long been known for being a symbol of fertility and new life. This is because rabbits are very fertile animals and can give birth multiple times in a year. The gestation period for rabbits is between 28 and 30 days and a doe can become pregnant again even just hours after giving birth. In Anglo-Saxon pagan tradition, there was a goddess called Eostre known as the goddess of spring. Her main symbols were the egg and the rabbit. There was a legend that the goddess found an injured bird during winter and in order to save its life, she transformed it into a hare. Although it was no longer a bird, the hare was able to lay eggs. Actually, the first Easter Bunnies probably were not rabbits at all, but instead hares. It is unclear why this change from hare to rabbit occurred, but one noticeable difference between hares and rabbits is that hares are generally larger. They tend to have longer legs and ears just like the modern day Easter Bunny. Since the Goddess Eostre was so important at springtime, there was a month-long festival dedicated to her. The festival started on the vernal equinox in March and lasted throughout the majority of April. When Christianity spread to Anglo-Saxons, many of the traditions during the festival of Eostre were adapted into the ceremonies in honor of the Resurrection of Christ because they both occurred in the same month and encouraged many pagans to convert. As a result, the English name of the Easter holiday is derived from Eostre. Now, rabbits (or hares) come into this story because they’re the symbol of Eostre, but also because the rabbit has a strong connection to the moon in pagan tradition. The hare was believed to be a symbol of the moon, and the cycles of the moon are actually what determine what day we celebrate Easter each year. Easter is celebrated on the next Sunday after the Paschal moon which is the first full moon after the Vernal Equinox. In other Easter folklore, the fabled white bunny we’ve come to know originated in Germany in the 1500s, where it was originally a white hare. It was believed that if a young child was especially good, the Easter Bunny would leave a nest full of colorful eggs. At the beginning, the children would use their caps or bonnets as nests for the eggs, but these were later replaced by the now familiar baskets. In the eighteenth century, German immigrants to Pennsylvania brought the Easter Bunny tradition to the United States where it became quite popular. Germany is also where the first edible Easter Bunnies originated in the 1800s. They were first made of pastry and sugar. The way you celebrate Easter each year may be somewhat different depending on where you live. Many places celebrate with the Easter Bunny but a few others have different animals delivering their Easter treats. For example, in Switzerland, cuckoos deliver colorful eggs to children, and in Westphalia, Germany, they believe in the Easter fox. However, the most popular way to celebrate still seems to be with stuffed animal bunnies, rabbit-shaped chocolate and marshmallow candies and, of course, large anthropomorphic rabbits. One has even made it to the White House, presiding over the annual Easter Egg Roll with the Presidential family. How do you celebrate Easter in YOUR country? So, I would suggest that if you want a fun way to amplify your vocabulary, ban yourself from using a word for a while and see if you can find other ways to say what you want to say. It is best perhaps an exercise used to try to replace those words that you use often. You can also use it to look at opposites, plus all those new alternative words will themselves have their own synonyms and antonyms. Give it go! It might be fun! Extra tip: Never start a sentence with ‘but’! It’s bad grammar. Many people from different countries have improper intonation because their teacher had improper intonation. In many situations, being monotone is better than having bad intonation. The worst is when someone goes up and down too much on every word. Another thing you should avoid is to end high at the end of a sentence. To correct improper intonation, you need to remember to start high and end low. You cannot do it any other way. I recommend going to the interview section and listening to one of the audio files provided by a native speaker. You will hear proper intonation. After listening to the audio, record yourself and listen to it. Does it sound the same? If not, then find the areas that are dissimilar and make the necessary corrections. This advice is very trivial, but intonation is relatively easy to correct. You can fix your intonation with only a little effort. If you have a friend who is a native English speaker, you can usually fix intonation in a couple of lessons. Recording yourself and listening to yourself might be tedious, but having correct intonation can go a long way. I have had many students who fixed their intonation after 2 small sessions. The advice I gave them was the same as the one above. This will work, and if you want to speak with proper intonation, please follow this advice. A common mistake of people who obtain English fluency with improper pronunciation and intonation is the speed in which they speak. Because they do not have perfect pronunciation and intonation, it is difficult to understand people who speak too fast. This is the biggest problem I have seen from people who gain confidence in speaking. In order to improve your communication, and to hear “excuse me” less often, it is important to have the correct speed of speaking. For people with confidence, my advice is to slow down and to speak clearly. Don’t blend words together too much and make sure to separate words with a small pause for words that are difficult to pronounce.